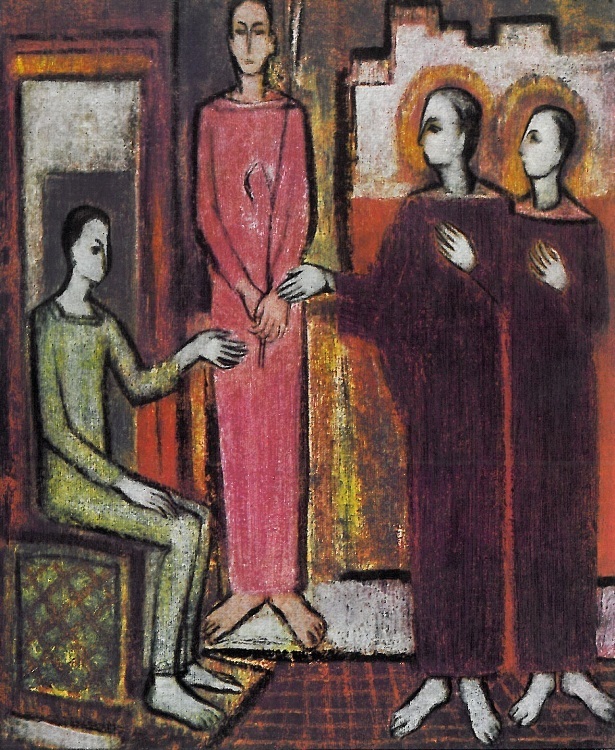 The Roman is part of the Stations of the Cross made around 1960 by the Flemish artist Luc-Peter Crombé. The Stations of the Cross portray Jesus’ path of suffering from his condemnation to his grave. In the first centuries CE pilgrims went to Jerusalem to walk Jesus’ last footsteps. As a pilgrimage to Jerusalem was only possible for a limited number of people, the custom developed to represent Jesus’ road to Calvary in monasteries and churches in the form of sculptures, frescoes or paintings. While pausing and standing still at each representation (hence the word ‘station’), the believers could pray and meditate on the distress that befell Jesus on his via dolorosa. At first the representations adhered to the stories as they appear in the four Gospels. But soon elements from other sources were also taken over, such as Jesus meeting Veronica. According to the legend Veronica handed Jesus a cloth to wipe off his bloody sweat, leaving behind an imprint of Jesus’ face on the fabric. When in time the number and content of the stations started to vary, Pope Clemens XII established around 1740 of which 14 images the Stations of the Cross should consist. One can find them in almost every Roman Catholic church in Western Europe. After a number of study trips to Southern Europe and Northern Africa Luc Crombé returned in 1959 to the monastery where he had stayed before his travels. The silence of the cloisters and the prayers inspired him and resulted in a large number of religious works. During this period he also painted the Stations of the Cross. They deviate from the usual series, as Crombé chooses different themes and paints only 13 stations. They are also a representation of his own path of suffering. With Crombé The Roman (Jesus before Pilate) is the seventh station. In the traditional sequence of stations this usually is the first. Apparently the artist wants to put extra emphasis on the suffering which Jesus encounters during the first hours after the Last Supper, when he has to leave behind his friends and to face his fears, when his closest friends betray and deny him and he is subjected to a tragic mock trial. In the image above we see Pontius Pilate with two Jewish priests, who accuse Jesus of blasphemy and incitement against the Roman emperor. Crombé has placed the priests in front of the courthouse and not on the pagan ground inside the Roman court to emphasize their concern to stay clean for the approaching Jewish Passover. He has portrayed haloes around the heads of these Jews, which is very unusual in the history of art. In this way the artist accentuates their alleged integrity. These dark-coloured figures demand a trial. They put their hands on their hearts, yet they are ruthless and hypocritical. Pilate is well disposed towards Jesus and wants to leave him and his teachings alone. Yet in order not to endanger his own position, he panders to the priests. With the gesture of his hands Crombé seems to express how Pilate gives with his one hand, while taking it back with his other if circumstances so dictate. Jesus towers above all the others in a strongly vertical position that brings out his spiritual orientation. Something terribly unjust is happening here, but Jesus stands there very quietly. He literally is above all that is taking place. The reed in his hand hints possibly both to his flogging and to the stalk with which sour wine will be offered to him at the cross and so point to the consequences of Pilate’s judgment. What is happening to Jesus here? What evil is confronting him? The sanctimony of his fellow believers, horrific abuse of power and injustice out of self-interest. Jesus walks this path of suffering and takes it all upon himself. For us. For me! Luc-Peter Crombé: The Roman, Stations of the Cross # 7, ca. 1960. Reina Folkerts is a consultant who runs INZICHT Consulting (www.inzichtconsulting.nl), giving courses, workshops and coaching for individuals and organizations to help them develop their potential. Over the last years she has developed an interest in Stations of the Cross. She is attracted to them by their artistic merit as well as their spiritual meaning.